A virtual Cemetery Tour of the South Park Cemetery, the resting place of many of our Wilson and Cheney ancestors. 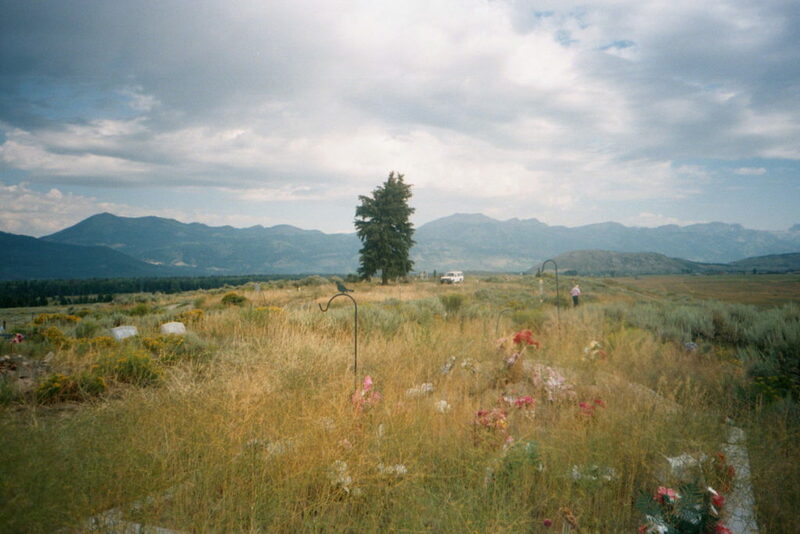 My first visit to the South Park Cemetery in Jackson, Wyoming was in August 2002. 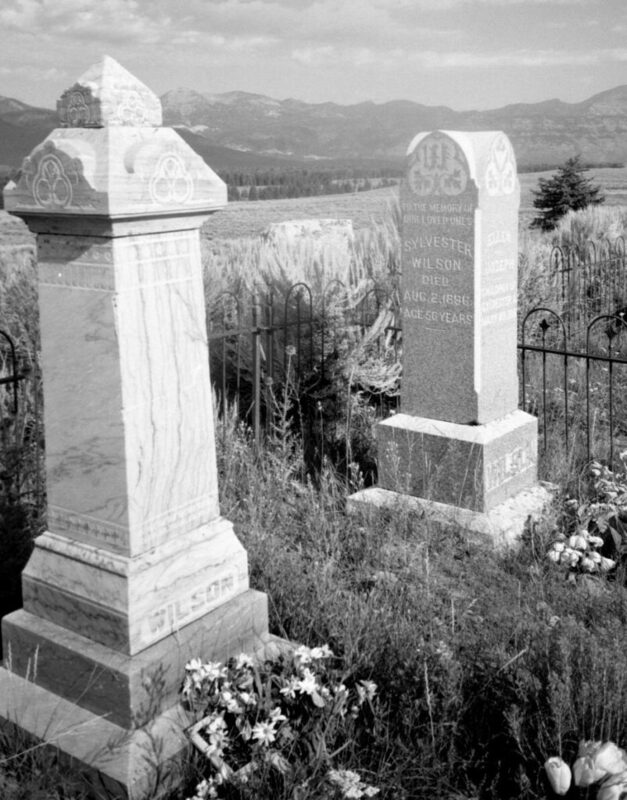 Our family had enjoyed vacationing in Jackson Hole for years before I learned enough of our family history to search out graves of our ancestors. For this particular trip, my father joined us. Because he is an early riser and my husband and children are not, nor were they interested in being drug through a cemetery at any hour, Dad and I went alone early one morning. 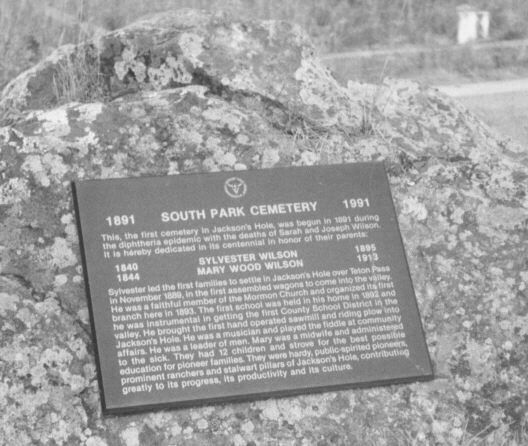 The cemetery sits on a hill, south of the town of Jackson, in the area known as South Park where Sylvester Wilson settled in 1889. There are spectacular views from this point. 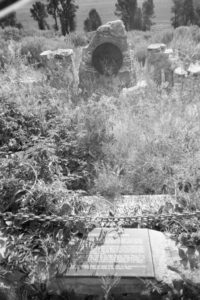 The cemetery itself is not large and most of it was rather overgrown. 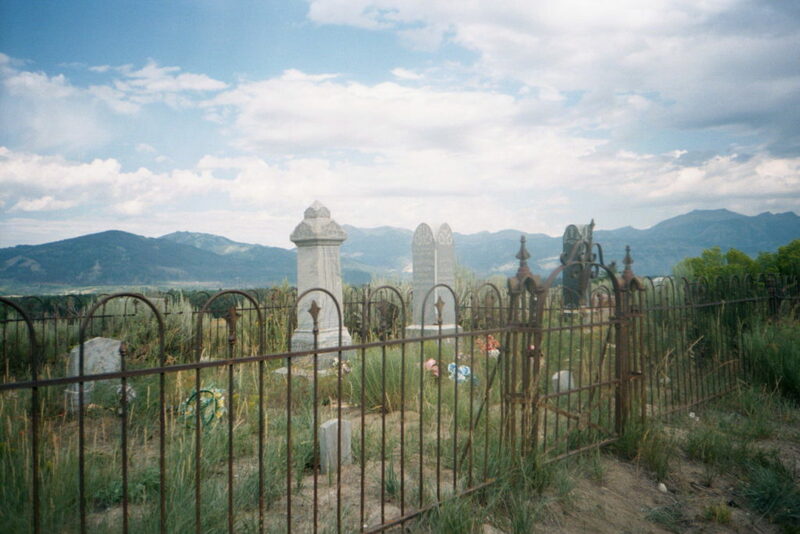 A fence enclosed many of the Wilson family graves. The Wilson and Cheney families had come to Jackson Hole in 1889. They had two years before there was a need for a cemetery. That need came because of a diphtheria epidemic. This started on the Idaho side of the Tetons. Sylvester’s son John had gone to meet his sister Rebecca who had not seen her family since her marriage in 1889. She wanted to come visit the family. The nearest railroad stop was Eagle Rock. For some reason Rebecca was not able to make the trip. John received this news when he arrived at Eagle Rock. He then decided to visit his Uncle Nick Wilson. Nick was away from home doctoring victims of this epidemic, while three of his children died at his home. John was exposed to this disease and carried it across the mountains. When he returned home he bathed and thoroughly washed his clothes before entering the house, but still the disease spread. It claimed two of the Wilson children, thirteen year old Sarah Ellen “Ella” on June 12, 1891, and ten year old Joseph on June 30, 1891. There is a lone pine tree which stands out on the hill and can be seen for miles around. I recall being told a story about this tree being planted when these children died. I now can’t find any details of that story. The tree still stands, however, and is very large as can be seen by the contrast with the truck parked by it. 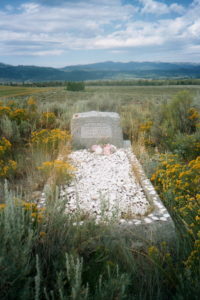 Sylvester led the first families to settle in Jackson’s Hole over Teton Pass in November 1889, in the first assembled wagons to come into the valley. 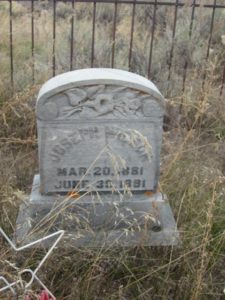 He was a faithful member of the Mormon Church and organized its first branch here in 1893. The first school was held in his home in 1892, and he was instrumental in getting the first County School District in the valley. He brought the first hand operated sawmill and riding plow into Jackson Hole. He was a musician and played the fiddle at community affairs. He was a leader of men. Mary was a midwife and administered to the sick. 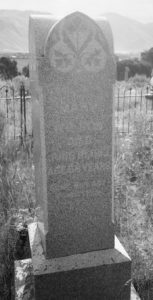 They had 12 children and strove for the best possible education for pioneer families. They were hardy, public-spirited pioneers, prominent ranchers and stalwart pillars of Jackson’s Hole, contributing greatly to its progress, it’s productivity and its culture. There are two large Wilson markers within the fence. The one has Sylvester Wilson on one side, Mary Wood Wilson on another side as seen in the smaller photo, and Ellen and Joseph, the children who died in 1891 on the other side showing in this photo. This other marker with a fancy top, also appears to be for Sylvester Wilson. There are smaller markers for Sarah Ellen and Joseph, the children who died in 1891. 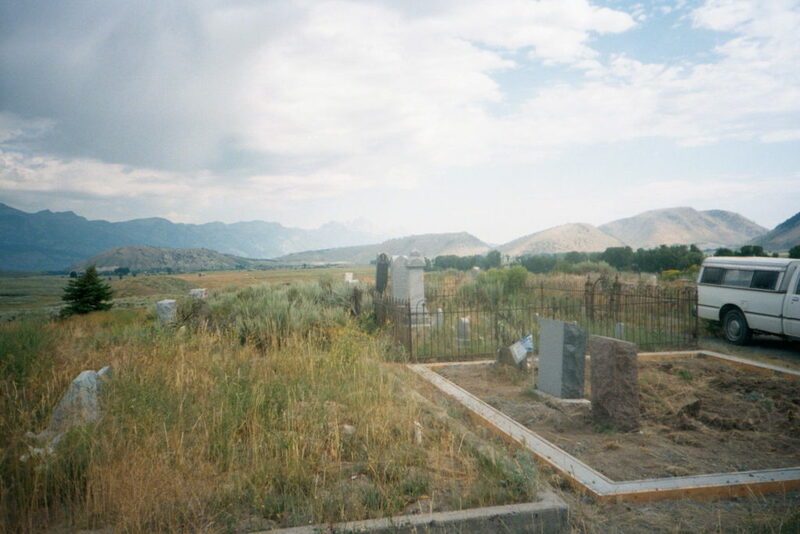 The South Park Cemetery contains graves of many members of the Wilson family. I did not take photos of all of them. Most can be found on Find a Grave. Uncle Nick is my exception. 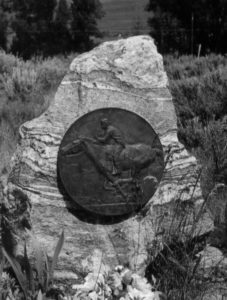 His grave is here as well as markers commemorating his experience with the Pony Express. 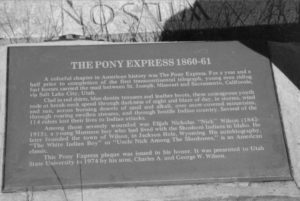 A colorful chapter of American history was the Pony Express. For a year and a half prior to completion of the first transcontinental telegraph, young men riding fast horses carried the mail between St. Joseph, Missouri and Sacramento, California via Salt Lake City, Utah. Clad in red shirts, blue denim trousers and leather boots, these courageous youth rode at breakneck speed through darkness or night and blaze of day, in storms, wind and sun, across burning deserts of sand and alkali, over snow-covered mountains, through roaring swollen streams, and through hostile Indian country. Several of the 114 riders lost their lives to Indian attacks. 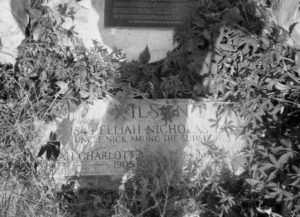 Among those severely wounded was Elijah Nicholas “Nick” Wilson (1842-1915), a young Mormon boy who had lived with the Shoshone Indians in Idaho. 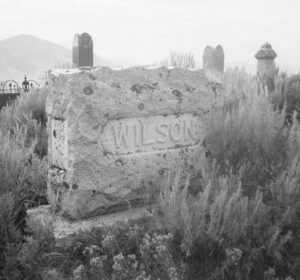 He later founded the town of Wilson, in Jackson Hole, Wyoming. His autobiography, “The White Indian Boy” or “Uncle Nick among the Shoshones” is an American classic. 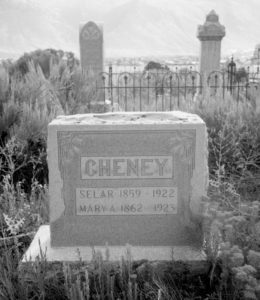 Selar Cheney took his family to Jackson Hole along with his wife Mary Alice’s family. They both died and were buried here along with most of their children. 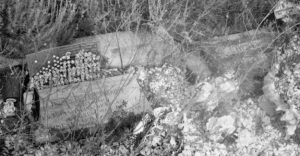 Mary Ellen died in Castledale, Emery County, Utah before the family came to Jackson Hole. 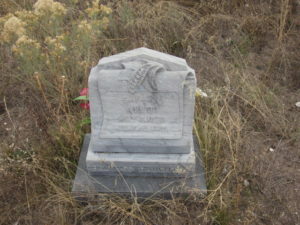 Talitha Cuma Cheney Eggleston died in Ogden, Utah and is buried with her husband in the Eden Meadow View Cemetery. I made another trip to this cemetery years later. On the drive up, I was surprised to see land being cleared in preparation for some kind of development. I wonder what our ancestors would think of their peaceful cemetery on a hill now surrounded by homes and I think a golf course. The view is still beautiful, if you look up. 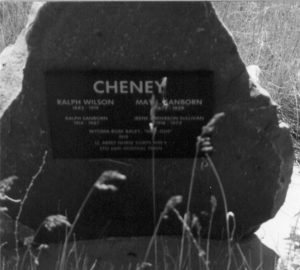 Photos and information about these families is in my book Cheney Wilson Family History Book. 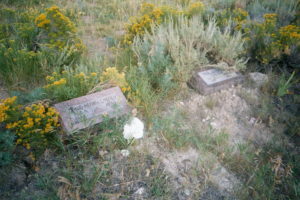 This entry was posted in Cemetery Tour, Collateral Lines and tagged Cemetery, Cheney, Eggleston, graves, Wilson, Wyoming. Bookmark the permalink.